I was on the radio the other day talking about the drastic shift in the standards of locker room decorum since the Dye-beat-us days of birthday showers and cee-gars. “Wait—Pat Dye would pass out cigars in the locker room?” Rich “Ride In A Jeep” Perkins, host of The Drive, asked. Yes, he would. And the players smoked. And the smoke billowed. And the cameras rolled. And the theme to The Natural played. And it was great. And I only just now remembered that Coach actually brought up the first time he bought cigars for his players during one of my lost (and found) interviews with him back in 2010. It was the week of the 1982 Iron Bowl. Well, he actually didn’t buy the cigars himself—he sent Hub Waldrop, Auburn’s Athletic Trainer to buy them. Dye: Alabama had a good football team, but I was confident we were going to win the football game. I could just feel it. I could just sense it, feel it. And I sent Herb Waldrop to get a two boxes of cigars the Wednesday before the game. He looked at me kinda funny. He said ‘what?’ ‘Cause I ‘d never done that before. Me: How much money did you give him? Coach: Well, what’s two boxes of cigars cost—$40? Me: You remember what kind they were? Coach: Aw, hell no. That’s irrelevant. 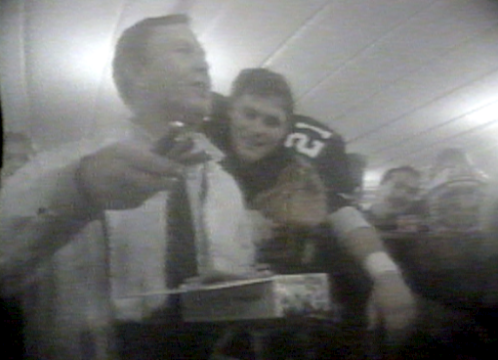 Related: VIDEO: Auburn players celebrate Pat Dye’s 44th birthday with shower, spanking after beating Maryland in 1983. And, Coach, come on. No detail from beating bama is irrelevant.